Brabus Tuning CodeSmartCar Tan Code Cal. At last! 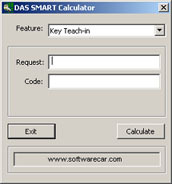 you can now purchase individual Smart Car Tan Codes (Key Teach-in Codes), and other special equipment codes at a reasonable price, online. Your code will be emailed to you after purchase. Please use the "Note" field in the Checkout Section to let us know your VIN number and Module. If however, you need lots of codes then please see our new "Smart Tan Code Calculator" here. Remember, whilst we endevour to respond immediately, we work normal office hours at GMT + 1 time. Please keep that in mind especially when ordering Key Teach-in Codes. Also remember to check your junk / spam folder before enquiring about any order.